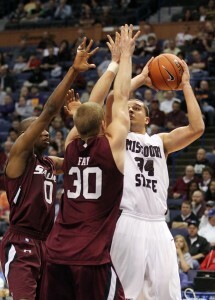 This had all the makings of being something real ugly for the Missouri State men’s basketball team. For the first 39 minutes, Southern Illinois was in control and ready to pull off the biggest upset in the history of the Missouri Valley Conference Tournament. However, #1 seed Missouri State scored the last 11 points of the game, including the game-winner by regular season MVP Kyle Weems, to pull off a stunning comeback win, 58-56. Under the current tournament format, the No. 1-seed has never lost to a No. 8-9 seed. SIU held Weems to 5-of-18 shooting from the field and the Bears (24-7) to 33% for the game. SIU was up 9 with 2:30 remaining, but Adam Leonard drained a deep 3-pointer. Weems and Leonard each hit another trey to tie the game, 56-56, with 46 seconds remaining. Southern had a chance to go back ahead, but Kendal Brown-Surles missed a running jumper with 16 seconds to go, setting up the heroics by Weems. After a timeout, the Bears cleared out for Weems who drove and hit an off-balance fadeaway from 10-feet out over Carlton Fay. The shot with 1.4 seconds remaining gave MSU its first lead of the game.